1st-line carefully selects cleaning agents based on their performance and value. With over 15 years experience, we have tested many espresso machine cleaning supplies, and we found the ones below to be effective while causing the least damage to the parts inside your equipment. 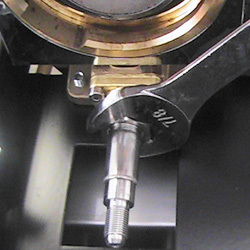 For example, we have seen some descaling agents eat at the metals inside an espresso machine. Our grinder tools can make the cleaning job easier. From grinder brushes to water treatment options, we have the right stuff to make your cleaning more effective! Without proper cleaning and maintenance, the performance and beverage quality from your espresso machine and coffee grinder will deteriorate much more quickly than normal. Lack of proper maintenance can lead to costly damage to your investment. Whether you need to clean a home coffee maker or espresso machine or a commercial set up, using the improper cleaning supplies can destroy your flavor profile or the materials of your expensive machine. Since 1997, 1st-line Equipment has proudly served the espresso enthusiasts nationwide with top grade machines, components, coffee beans, and customer service. Our simple mission is to select and provide the best, highest quality European espresso machines, coffee grinders, coffee makers, and information. To this end, we also supply the best espresso machine cleaning supplies and grinder tools so that you can keep your devices running. Giving you the atmosphere of an Italian espresso bar in your place is what we do. Maintaining that atmosphere is up to you. 1st-line Equipment hand picks and thoroughly tests espresso machines so you don’t have to. Just about every home espresso machine worth considering is evaluated by us, and if found satisfactory, stocked and sold by us. That being said, there is required maintenance that if not performed will lead to the early demise of your tools, regardless of their European quality. At 1st-line Equipment, we strive to keep our prices competitive, while offering you the most comprehensive customer support seen anywhere in the industry. In most cases, we publish prices for our products. However, in certain cases, we cannot publish prices due to manufacturer’s policies. To insure you are charged the price you are quoted, we verbally review the items and respective prices as we build your order. In cases whereby prices are not advertised on our site, we will email you a copy of the invoice before shipment for signature. An invoice and credit card charge slip will usually accompany your shipment, unless you request otherwise.